Thorsten: You’ve been struggling to figure out “your Kona puzzle.” Have you been able to make progress or come up with new ideas and plans? Meredith: All you can do with Kona is keep learning, adjusting and tweaking some more until you can finish feeling good about your race – and have really RACED IT! I have yet to accomplish this, so it is always back to the drawing board, taking the good things that happened and changing the negative ones. The list is too long to properly discuss: from mercury poisoning, periods, swallowing salt water, heat strokes, crashing, and so on. The competitor in you keeps coming back, and that’s why we as triathletes love racing. This sport is genuinely a beautiful and perplexing type of pain and an enriching and rewarding type of pleasure. The bottom line, working with Darryl Griffiths of Shotz Nutrition has helped dial in my nutrition and hydration, training in humidity should hopefully help the body adapt better to the heat, getting Mak on a good schedule should allow more rest, and having the goal to finish with gusto should all be positive things. In addition, I have the utmost trust in the team to get me to the start line ready to fire. Now, you just race and see how it plays out. T: How’s the recovery from Mont Tremblant been for you? Have you been able to get in another “big build phase” for Kona? M: There was a lot of information that I learned from racing Mont Tremblant, so you take that and apply it to your training and lead into Kona. I had been racing on adrenaline the past few months, and this deficit came to fruition during the later stages of the marathon. It’s been key personally to focus on the pillars of performance outside of training and racing such as recovery, sleep, nutrition, hydration and whatnot – the ones that I preach yet haven’t done a good job practicing myself since Mak was born and that is on ME to correct. The primary objective is to fix this heading into the world championships or else, like in many previous years in Kona, I will be in a coffin on the Queen K! The goal for Kona is to execute a race where I finish like the athlete I started and show better GUSTO out there. I’m hopeful that training in the humidity of Ohio will help a bit as my experience from countless failed attempts trying to perform up to par on the Kona course. T: How much of a rhythm have you been able to get with Mak and how is that affecting your ability to train hard? M: Sticking to a schedule and being efficient is a must when also caring for the life of a human. He is my world and priority so you need to work around his needs and dictate, as much as you can, a regular schedule he can adhere to. Some days this happens with clockwork-like precision and others it is a little touch and go. As mentioned, the biggest thing that I learned after Mt. Tremblant is that I need rest and recovery; I couldn’t operate at the pro athlete elite level with getting an intermittent three to four hours of sleep per night. My husband and I devised a plan to get Mak semi-sleeping through the night which has helped me get the training/rest/recovery balance back on track. T: In your 2018 IMs you’ve been struggling to have a good run towards the end of the marathon. Have you figured out where this is coming from, and have you been able to work on it for Kona? M: It is always a work in progress since having Mak. No manual tells you how to give birth to a child via an emergency C-section and work your way back to pro athletic condition. In addition, no manual tells you how you can also nourish your child (most important) and return to racing at the same level as well. You learn as you go through trial and error. As I have said before, all of your deficiencies show up in the second half of the marathon. They surely would, even if I didn’t just have a child! In my case, if you were not getting proper sleep a month before a full-length triathlon and nursing your son four or five times per night, your legs would feel it on mile 20. If you didn’t make the time to hydrate the weeks leading into a race, it would hit your hard once your legs hit the pavement. I know better and was flying high on new mom adrenaline, which I thought would help me do better in that back half. SO: shame on me! Those are things that you can hide in a half Ironman – less so in a full Ironman! So, to answer your question, the reason I have raced so much through the summer was to qualify for Kona and to figure out my body after it has gone through such a rigorous procedure, childbirth. Yes, you have to worry about nutrition, hydration, rest, recovery and training. But, as a female, after giving birth, you have to deal with hormones, milk production, interrupted sleep, etc. These are not excuses in the slightest, they are simply the reality that a considerable portion of the population navigates through if they are trying to come back on their athletic journey. It is all new to me, so we train, race, learn and do it all over again until you have the formula somewhat down. T: All in all, what’s your plan for this year’s race? Any plans on following the super-fish Lucy and Lauren or is it going to be “race your own race” (maybe until late in the marathon)? M: I know it sounds cliché yet this Kona race is me against the course and conditions because they eat me alive year after year. If I get to that run and all systems feeling somewhat vibrant, then maybe I might start thinking about the competition. If I am in Energy Lab and not in a coffin, I might check out who is around! The goal is to cross the finish line with my wits about me and hold Mak in my arms and give AK a big hug – this will be a good day! ALSO: Lucy and Lauren are in a league of their own. In Mont Tremblant alone, Liz and I had a little laugh after the race as we tried to stay with Lauren for literally 20 yards before we realized that it just wasn’t going to happen! So us “front pack” swimmers are going to be chasing those fast fish! The goal would be to try to keep them within even 5 minutes…that would be good! T: I’m sure that after your Kona your season won’t be over and that you’ll be racing Arizona again? How much is the new qualifying system affecting your race plans? M: Although I will continue racing for as long as the body will allow, I know that I am on the pointy end of my career. These old legs still have several years left in them and I hope these next few years are the better years within the career! 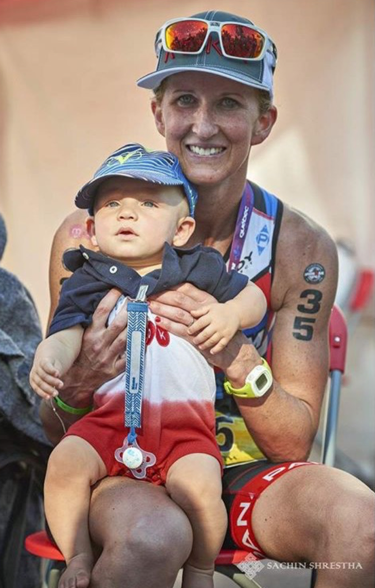 You got it – aside from last year when Mak was born IMAZ weekend, we have never missed a running of that event. We look forward to being back in Tempe mid-November and then we will head to race Challenge Daytona in early December. My husband and I will then sit down and map out 2019. We have been dreaming of taking Mak to our haven of Taupo, New Zealand so we look forward to heading there in March for Ironman New Zealand with a stop in the South Island along the way for Challenge Wanaka, a race that we have been wanting to do for a long time! It would be a luxury to qualify for Kona, as that means you won an IRONMAN so we will just have to go with the flow on all of that or it might be an offshoot if things play out that way. After 60+ Ironmans and countless half races, it sometimes is beneficial to step back and smell the roses without any particular race or objective in mind!